Rearick Tooling includes a Wire EDM job shop specializing in wire EDM (WEDM) and conventional EDM services.Our 10 Wire EDM and 5 conventional EDM machines are capable of automating the manufacturing process through LIGHTS OUT operation. Saving you money with a fast turnaround. Wire EDM is a method allowing us to cut conductive materials with a thin electrode or wire that follows a designated, programmed path. This wire is surrounded by de-ionized water and is charged to a voltage very rapidly. The part and the wire make no physical contact as the voltage makes a spark jump the gap and melt a small portion of the part being worked on. The de-ionized water then cools and flushes away the small particles from the gap. Wire EDM is ideal for your delicate parts and projects, with ultra precise accuracy up to +/- 0.0001. No tooling is required to produce wire EDM parts, which allows a quick turnaround. 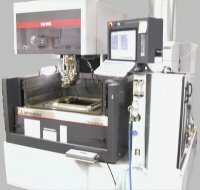 Our wire EDM machines are Mitsubishi, running .004 diameter to .012 diameter wire. Wire cut inside radii down to .003 and areas as small as .008 wide depending on material and thickness. Our largest Wire EDM has 19"x13"x11" travel. The wide range of capabilities offered by the company allows us to do a lot of work in the medical, electronic, and aerospace industries. Our Conventional EDM department uses Hansvedt, manual and CNC, as well as AGIE Advance 3 CNC RAM EDM with 21"x15"x13" travel and 10 position electrode changer. 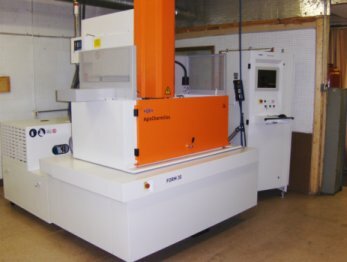 This equipment allows us to produce complex 3D jobs or your custom made conventional EDM parts. We utilize the latest DP Technology Espirit CAD/CAM Software for our programming systems. This allows us to quickly program 3-Axis and 5-axis complex geometry. 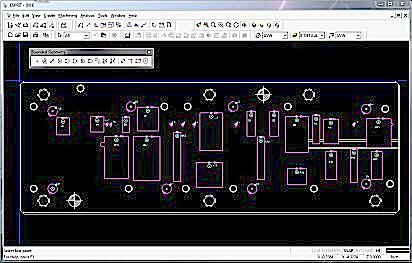 Customer provided dxf, igs, and dwg files have the ability to be generated into programs by our skilled staff.